The famous California chain In-N-Out has always offered its customers the chance to make their burgers and fries Animal Style. With extras like mustard grilled patties, extra Thousand Island spread, oozy cheese and more, the items off the Secret Menu are over the top. Now, Velas Resorts in Mexico is upping the ante. 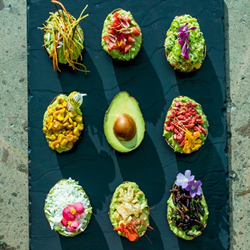 The luxury resort collection with properties in Los Cabos, Puerto Vallarta, Riviera Maya and Riviera Nayarit offers its guests the opportunity to take their guac to the next level with traditional Mexican delicacies like grasshoppers, ants and worms. The famous California chain In-N-Out has always offered its customers the chance to make their burgers and fries Animal Style. With extras like mustard grilled patties, extra Thousand Island spread, oozy cheese and more, the items off the Secret Menu are over the top. Now, Velas Resorts in Mexico is upping the ante. The luxury resort collection with properties in Los Cabos, Puerto Vallarta, Riviera Maya and Riviera Nayarit offers its guests the opportunity to take their guac to the next level with traditional Mexican delicacies like grasshoppers, ants and worms. The toppings, some painted in gold and silver, are in addition to the traditional favorites like red onion, tomatoes, an assortment of hot sauces and cotija cheese. Prepared tableside, it can be paired with a choice of tequilas or mezcals from an extensive menu.